Since we started making our Christmas puddings again it’s been my favourite part of Christmas dinner maybe even one of my favourite parts of the entire day and I just made Christmas pudding healthy? Okay so if you’re not fully versed in Christmas puddings and are interested check out my Christmas pudding recipe from last year, I swear by it, it’s the bread and butter of my Christmas, I would live and breathe this pudding, make one large enough to live in like an igloo and slowly eat the walls....I think you get the point. I will still be eating that this year, although side note still haven’t made that yet, whoops, but if you’re vegan, eat raw food (do people who eat raw consume alcohol? 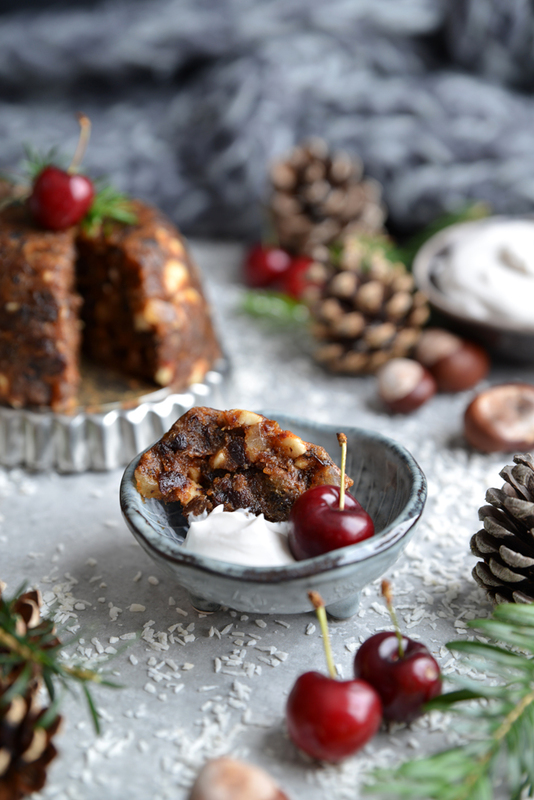 I don’t know the rules) or you want Christmas pudding early I just came up with a genius recipe. I’ll just say now how impressed I was with the flavour of this, I feel like I got it down to a T. I used the same spices as in my normal recipe, soaked the dates in a mixture of cider, apple juice and water to add that cidery undertone without it being too alcoholic and soaking the fruit in brandy. 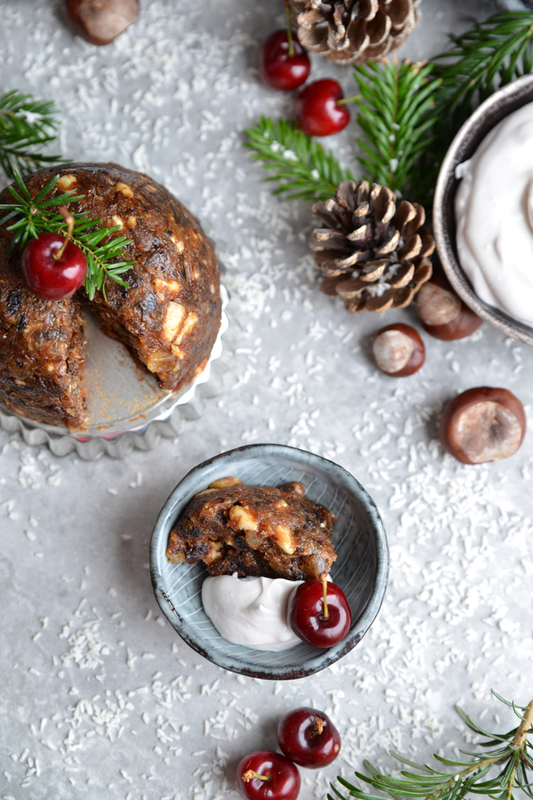 The texture is a little softer than a traditional Christmas pudding but really it tastes so good it doesn’t even matter. Also, this recipe just consists for fruit, almonds, spices and a little alcohol it honestly blows my mind what you can do with ingredients. 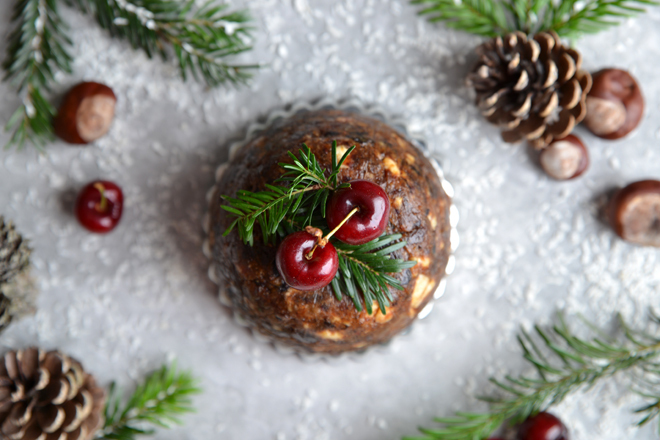 This idea started off as Christmas pudding truffles but I couldn’t resist the idea of slicing up a mini Christmas pudding which is basically just a giant energy ball so if you would prefer you can make them in to truffles. In that case they would be great for after dinner and probably a little easier to portion out, either way they’re going to taste delicious and maybe be a fraction healthier than a traditional pudding. Put the sultanas, currents, dried pineapple, glace cherries and almonds in a bowl, pour over the brandy and set aside to soak stirring occasionally. Place your dates in a bowl and cover with cider, apple juice or water depending on your alcohol/sweetness preference (I used a mixture of all three) and leave to soak for about 10 minutes. After the dates have soaked, drain and place in a food processor with the mixed spice and nutmeg. Once the dates have formed a smooth paste add in the ground almonds until the mixture becomes less sticky and forms more of a ball, you may need to add a little more or less depending on how moist your dates are. Add in the brandy soaked fruit and nuts and pulse gently until the mixture is evenly distributed but make sure the fruit stays mostly whole and doesn’t get blended. 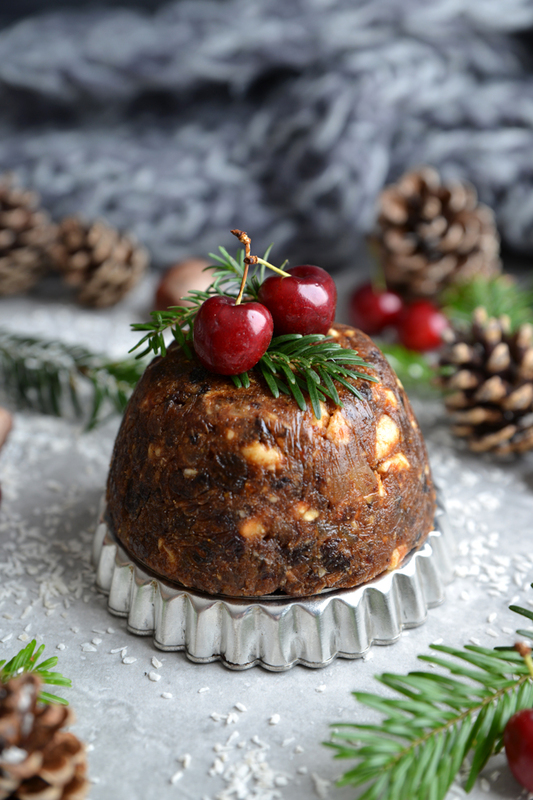 Place the mixture on a plate and form the Christmas pudding shape making sure to press down so the mixture is all compact, if you have a little bowl/basin about the right size line it with cling film and press the mixture down to form the shape then place in the fridge to set. It should take a couple of hours to be fully firm enough, alternatively you can put it in the freezer if you’re in a hurry that should take about 30 minutes – 1 hour, just make sure you don’t leave it in there too long. If you don't want to make a pudding to slice you can also make them into truffle sized balls. Once set slice into pieces and serve with brandy cream, I have a vegan brandy cream recipe here or if you’re not vegan I have a dairy brandy cream recipe here. 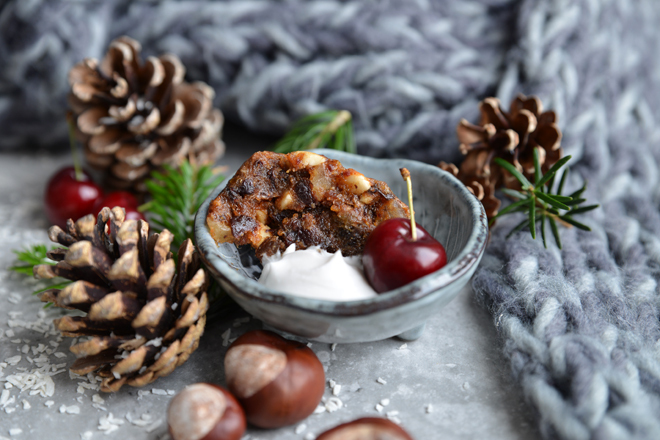 Traditionally you would heat a Christmas pudding before eating so if you’re not eating raw you can heat a slice in the microwave, it won’t take long, but it tastes delicious either way. What a great idea! Love this dense raw cake. Happy holidays! Thanks Caitlin, happy holidays to you too!